This mineral identification chart was created by Art Crossman as a college course project at Mansfield University in 1997. He did an outstanding job, organizing minerals on the chart in a systematic way - according to their properties. His mineral identification chart has been used in mineralogy and phycial geology courses at Mansfield University ever since. In addition, later students have used Art's chart in presentations made at meetings of the National Science Teachers Association. 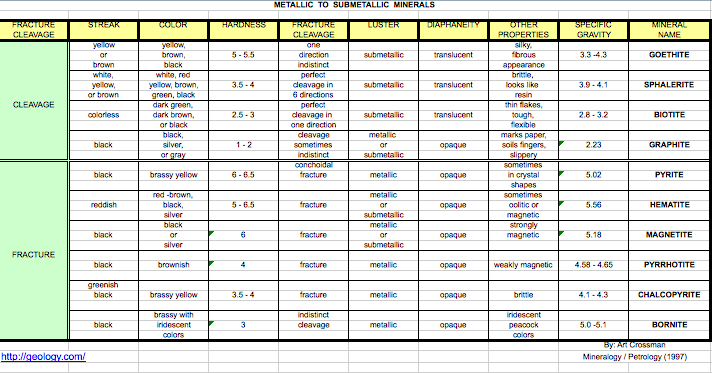 Now his mineral identification chart is available to students and teachers via the world wide web. It is an excellent example of how a great piece of work becomes popular and benefits many people. Thanks Art! Click the image to download the complete printable mineral identification chart by Art Crossman.